Storytelling is the most ancient art in which humanity still engages. From time immemorial we have gathered in groups to engage in the myths and legends of our people. From the hearth fires of ancient tribes to the glittering cineplexes down the street, stories help us to understand who we were, who we are, and who we wish to be. 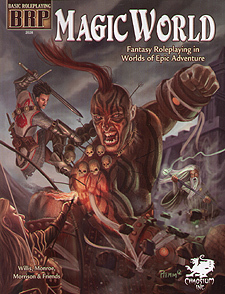 MAGIC WORLD is a complete set of rules allowing you and your friends to tell astounding stories of fantasy and myth. The rules codify what actions are available within the game, while remaining intuitive so that they do not get in the way of your enjoyment of the stories. The rules to MAGIC WORLD are easily remembered. Most tasks can be resolved with a single roll of the dice. Character creation is quick and intuitive, with numerous options as to character race, skills, etc. But don't take our word for it. Grab some dice and friends, make some characters and forge the stuff of legends! Magic world. Publisher Chaosium Magic world is the latest front line fantasy RPG from Chaosium, that uses their basic role play system. It is orientated towards heroic play, simple and yet quite detailed. Following mongoose’s acquirement of Runequest and its subsequent publication as MRQ1 then 2 and now legend with RQ6 also available from design mechanism from Messrs Whittaker and Nash, the time has been seen as right to revisit the game's past and introduce a new game based more closely on chaosium’s Stormbringer and Runequest 3 systems. While retaining the heroic flavor of Stormbringer Magic world is more structured in its character generation. It is also a generic fantasy world not drawn from any one particular literary source. It also certainly takes heartily after earlier Runequest editions, but without Glorantha. Magic is more powerful in MW than RQ and is not divided into arbitrary philosophical schools. The rules are streamlined and easier to handle than in the older RQ. While the new formats for Runequest are really very good indeed and this review has no intention of criticizing those excellent systems, they have perhaps moved on and changed in how they are played, at least a little. Magic world goes back to the beginning, brings it up to date and breathes life back into what was a truly wonderful game system. A GM book, a bestiary, a magic book called “advanced sorcery”, a GM screen and an adventure pack with added notes on the default world for the game that is called the “Southern Reaches” are all planned for future release. Magic world promises to be one of the very best generic fantasy RPGs in the market today.